Good afternoon everyone. I assume you all had a very nice time during the Spring Festival holiday. During the break, we received a lot of faxes, emails and phone calls for questions. We salute you for such professionalism and dedication. You are our role model. Now let us begin our today's press briefing. Q: In the 2018 CCTV Spring Festival Gala, there was a skit in which a Chinese actress was wearing blackface, pretending to be an African. This caused a fair amount of angry reaction on the Chinese Internet as well as internationally. I was wondering if the Chinese side believes that this skit was racist? A: This does not seem like a diplomatic question. Do you honestly believe that it has reached the diplomatic level? Reporter: It is kind of a diplomatic question because it is about China's image in the eyes of Africans, especially because in September, we will have the China-Africa Cooperation Forum summit in Beijing and many African leaders are expected to be here. A: If you want to ask something about the Spring Festival Gala, you may contact its organizer. As the Spokesperson of the Foreign Ministry, I can tell you that China opposes racism in all its manifestations. I do have read some reports and comments made by many media, especially western media. If someone is trying to make use of this issue to drive a wedge between China and Africa, I have to say that they are doomed to fail. China and Africa have forged impregnable friendship after going through hardships hand-in-hand, and the mutually beneficial cooperation between the two sides has yielded substantial outcomes. As regards how the China-Africa relations and cooperation have fared, no one knows better than the African countries and people. Q: The ROK Foreign Ministry said that after the Pyeongchang Winter Olympics, the ROK side will strictly follow the Security Council sanctions against the DPRK. It will make diplomatic efforts to peacefully resolve the nuclear issue by making good use of the ROK-DPRK interaction momentum created by the Olympics. The ROK will endeavor to persuade the DPRK to talk with the US at an early date and sees DPRK-ROK and US-DPRK talks as pillars of any dialogue aimed at denuclearizing the Korean Peninsula. What is your comment? A: We have taken note of these remarks made by the ROK side. As a close neighbor to the Korean Peninsula, China welcomes and supports these positive interactions and friendly cooperation taken place on the stage of the Pyeongchang Winter Olympics. We have been saying that the only way to break the deadlock where the Korean Peninsula situation has been stuck in a vicious cycle is to have dialogue and negotiation. Now with the ROK and the DPRK having taken the first precious steps, we hope that all the other relevant parties could jointly preserve and sustain such hard-won momentum of engagement, so that interactions between the ROK and the DPRK would be expanded to those among all parties, especially between the DPRK and the US, and we will be nearing the goal of pushing open the door for dialogue to resolve the Korean Peninsula issue. 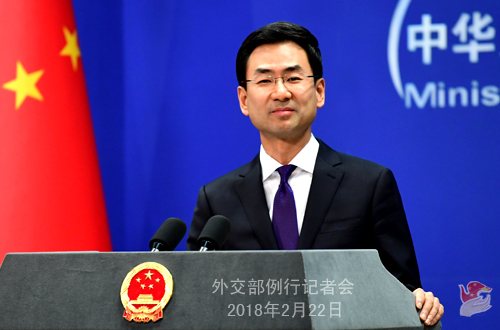 We hope that all parties could refrain from provocative and aggravating behaviors, since what is needed now is our best efforts to ensure a relatively stable Peninsula and create enabling conditions for dialogue and negotiation. As this window of opportunity presents itself, we hope that the DPRK and the US could seize it, demonstrate goodwill, and work towards the same direction, something that should be cheered on by the international community. Q: There was a report saying that China has been involved in talks with Baluchistan separatists in Pakistan, asking them not to sabotage the China-Pakistan Economic Corridor. Obviously, this is somewhere where China is investing a lot of money, especially for the Belt and Road projects. Is this true and can you give us any details of the talks? A: I have never heard of such things as you mentioned. The Chinese and the Pakistani governments have been working in coordination on security matters regarding the China-Pakistan Economic Corridor (CPEC). We appreciate that Pakistan has already taken a series of important measures for the effective protection of the CPEC projects and Chinese citizens. We hope and believe that the Pakistani side will continue with these efforts to ensure the safety of the CPEC. 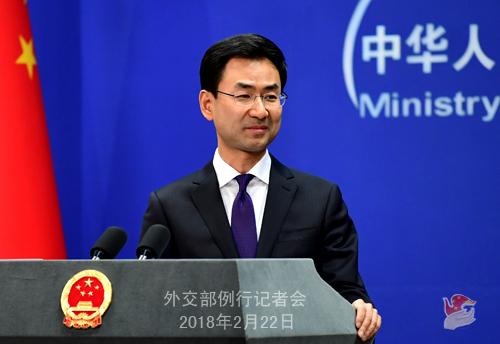 Q: Japan's Foreign Ministry said on February 20 that it had spotted what seemed like a cargo transfer between a small ship with Chinese characters on it and a DPRK vessel, possibly in violation of UN sanctions. Does China have any comment on that? A: We attach great importance to the relevant information and are carrying out investigation. 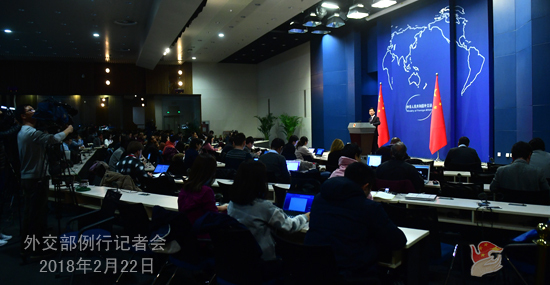 China has been fully and strictly implementing the Security Council resolutions and discharging its international obligations. Some time ago, the relevant departments of the Chinese government issued a notice which follows the Security Council resolutions in explicitly prohibiting smuggling by ship-to-ship transfer. If any individual or company under China's jurisdiction is found violating the Security Council resolutions, China will act upon solid evidence and seriously handle that in accordance with Chinese laws and regulations. Q: Nepal's new Prime Minister K. P. Oli said in an interview that China and India are major neighbors of Nepal. He wants to deepen ties with China and get more leverage in his dealings with India through implementing the current cooperation agreement between Nepal and India. What is your comment? A: China congratulates Mr. Oli on taking office as the new Prime Minister of Nepal and stands ready to work with the new Nepali government to carry forward China-Nepal friendly cooperation in various fields and realize common development so as to contribute to regional stability and prosperity. As neighbors that are important to each other, China, Nepal and India should enhance positive interactions for greater mutual benefits and win-win results. Q: Reports say that the Chinese military is strengthening air defenses along the China-India border, which has been reported as a counteraction to the threat from India. What prompted this particular measure by the Chinese military, especially in the light of the efforts by both countries to work out a kind of de-escalation after last year's standoff in Dong Lang? A: I am not aware of the specifics, and suggest you try the Defense Ministry. What I can say is that we hope that India could work with us to maintain peace and stability in the border areas, which serves the common interests of the two sides.